We took three more roosters out this past weekend. It was hard choosing who to keep and who to cull, but we finally made the decision and did what we had to do. 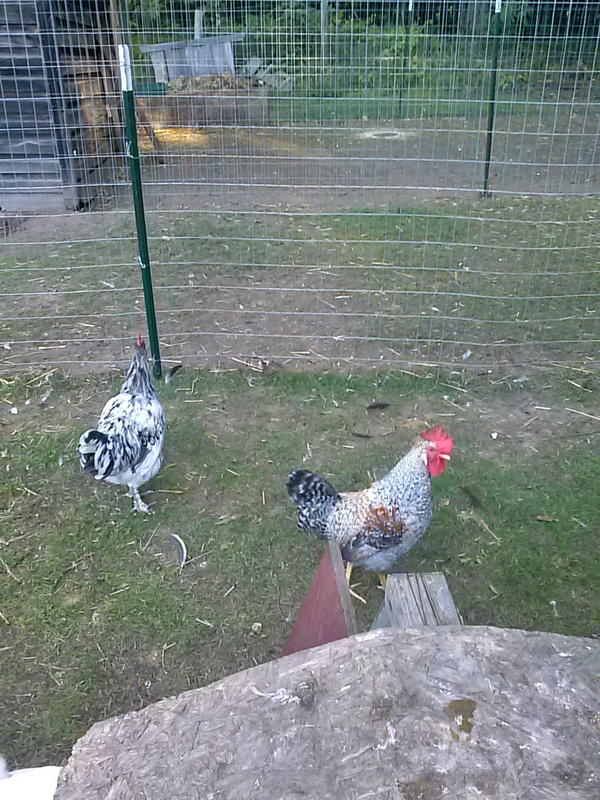 Now we still have three roosters left, and the plan is to keep them through the winter for breeding/protection purposes. If they all make it through the winter, we’ll have to see how they get along in the spring. For now, they all get to stay. So we now have 18 chickens: 3 roosters and 15 hens. Here are Splash and Wonky, two of the boys who got to stay with us. 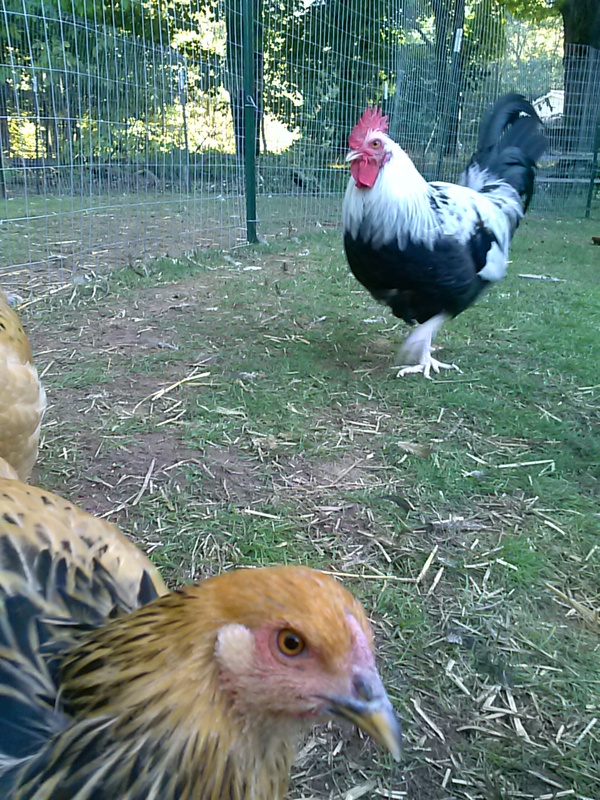 Here is Dorko, the Dorking, with a photobomb from one of the brahma hens. We’ve had the hens and roosters separated for a few weeks. 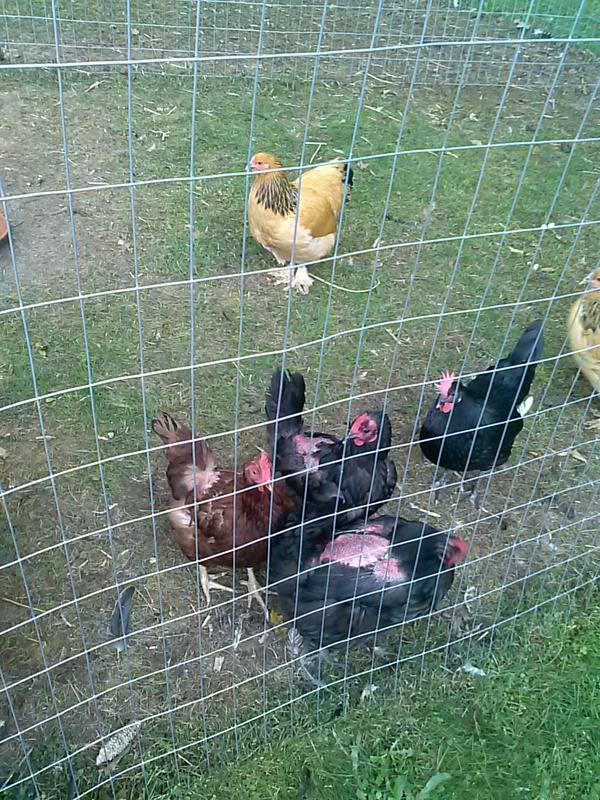 After removing the other 3 (older) roosters, we put these three back in with the hens, and things were mostly ok. I really noticed an issue at night when putting them in the coop though: the boys tended to get the most feisty then, going for any hen they could get ahold of. So for a couple nights we just put the roosters in their own room in the coop, and put them all together in the yard during the day. For the last couple days we’ve just kept them separate all the time; It was not as chaotic as it had been before, with all 6 roosters, but it was still kind of messy. My hens still are featherless on their backs. Some hens have had some of their feathers grow in, but not all of them. Some of them are also molting now (why they molt right before it will be getting cold, I have no idea). I think I may have to get some chicken sweaters for the winter. That may enable me to put the boys and girls together as well – at least the hens won’t get damaged from the boys (or as damaged) if they have sweaters on. We shall see. A picture of some of my ladies at the fence. 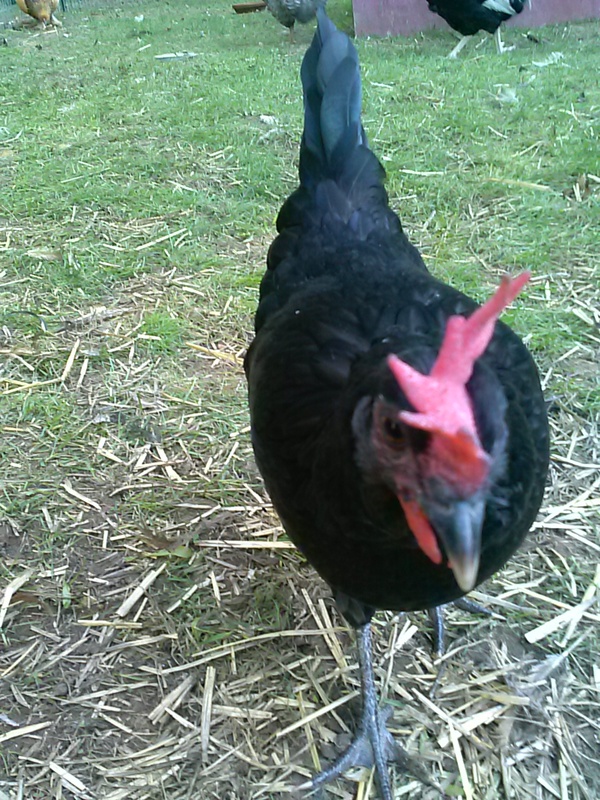 My small black hen, who I have been thinking was a Sumatra, now has grown a huge comb. Her ear flap things are white. Which means she is most likely a Black Langshan, not a sumatra. She has been flying up to the rafters of our coop lately, which is what I’ve expected she’d do – she likes to sit up there and watch the chaos as everyone else comes into the coop at night. I would almost think she’s a rooster because of the comb, but the Black Langshan rooster that we did have matured extremely early. Her comb is gigantic but not like his was. She flew over to visit the boys today and they didn’t mess with her at all. I don’t know if it’s because she’s just not sexually mature yet, or why else. Here’s my little langshan / not-sumatra hen. An update on our broody hen: She was sitting on 6 eggs that were due to start hatching last Thursday (that would have been day 21). I got home, moved the hen to check on the eggs, and somehow that day they got coated with mud or chicken poop or something. She may have had extremely dirty feet and turned the eggs and gotten them messy. But they were very dirty. I was torn about what to do, if anything. I wanted to clean the eggs off, but I worried that in cleaning them I would remove the bloom from them, which could help bacteria pass into the eggs. I tried wetting a paper towel and wiping a bit off just to see, but it was caked on there. My husband said I should just let nature take its course, so that’s what I did. She sat on those eggs faithfully, but we never heard any peeps or anything, and nobody hatched. I took the eggs out on Saturday and tossed them. I don’t know if they contained dead chicks, but by that point I don’t think they would have hatched. It’s so late in the year also, that if they had hatched and the hen wasn’t a good mom I would have had to bring them inside and then I would have chickens in my house for most of the winter. So it’s probably better that it didn’t happen now. We are planning on making a brooder box out in the coop for next spring, so we don’t have chickens in the house again (except for very tiny babies for a day or two after hatching), but we haven’t built that yet. Next Article Artichokes & Tomatillos – in the U.P.